Please note that we do not fill food, SPF products and FDA regulated products and hazardous material, including flammable material. What is the packaging process for liquid filling? Liquid filling can be done by piston; gravity and overflow systems. Pistons fill thick liquids with high pressure into the container while gravity relies on liquid falling into the container. Overflow systems remove the foam in foaming products in order to maintain correct fill amount despite changing containers. Overflow systems are necessary to ensure proper induction sealing. Level fills are mostly used for aesthetic purposes. All containers are filled up to a certain point so the fill amount is relative to each container. Volume fills are the opposite of level fills. The product is filled by volume only, exact to ounces, so the level may not be filled completely but the assigned volume will be filled. We can fill one-half of an ounce up to 64 ounces. We can fill high to low viscosity liquids. We have specialized fills for super viscous products. We can do level fills, cosmetic fills, and volume fill. What is the packaging process for dry filling? Dry filling is generally filled by an auger, a type of turning screw that drops a specified amount of product into the packaging. Dry fill can encompass several products so the packaging possibilities are endless. Dry fill like powders, granules, confetti, clay and bath salts may be filled in sachets, jars, containers, polybags, boxes, bottles and more. Check-weigh filling is a dry filling method that relies on weight in order to fill a specified number of product. Screws, nuts, bolts, washers and electrical components are often filled in packaging using this system. We can fill coarse products to fine powder. We can fill from on-half of an ounce up to a kilogram; up to 30lb bags. 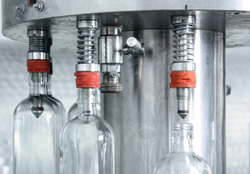 We can fill liquid and dry filling in tubes, pouches, bags, bottles, jars and cartons. We can fill using an automated process that seals, caps, lots and batch codes the product.